10-man Everton battled to a remarkable 2-0 win over Manchester City to kill the Citizens’ hope of the Premier League title this season. The first incident of a note came on 13 minutes as Everton saw Mirallas’ goal disallowed due to the offside error from the assistant referee. 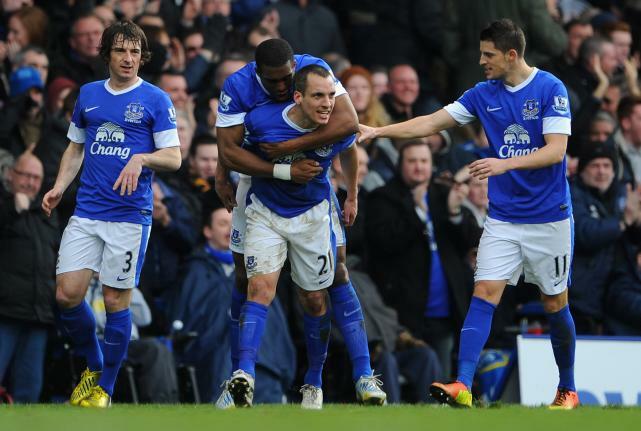 Everton right-back Seamus Coleman opened the scoring with a screamer from outside of the area in the 32nd minute. Steven Pienaar has been showed a second yellow card for a reckless challenge on Javi Garcia in the 61st minute. Despite Manchester City desperately trying to overturn a deficit and save the game, it was Everton striker Nikica Jelavic who rounded off Toffees’ victory in the dying stages of the game with a curling shot into the top left corner. The result means Manchester United went 15 points clear after a 1-0 win over relegation fighters Reading. Wonderful job, Mr. Moyes! Keep up!